In the first date announced for 2019, Hacienda Classical is to return to Manchester’s Castlefield Bowl on Saturday 13th July 2019 with Manchester Camerata, the city’s experimental orchestra for its fourth event there in what is proving an annual and signature event for The Hacienda in its home city. All previous Hacienda Classical concerts at Castlefield have fully sold out well in advance and are considered some of the best events in the city over recent years, attracting a mixed and energetic crowd to the clubbing classical cross-over concept which has proved so successful over its run so far. For 2019’s Castlefield event, we also welcome Inner City as special live guests as Kevin Saunderson has re-launched the seminal group with a concert at Detroit’s Movement Festival earlier this year which was the group’s first appearance in over twenty years. As Inner City comes back to The Hacienda where they played live at the original club, the group are the only artist to have had tracks featured in each of Hacienda Classical’s annual soundtracks to date with “Good Life”, “Big Fun” and “Pennies From Heaven. The band are also preparing new material for a select run of European dates in 2019 of which Castlefield marks their return to a city where they shaped the clubbing soundtrack in the late Eighties and early Nineties. Guest DJ’s at the event include DMC mix champion Mark XTC playing a special Hacienda Classics set joined by Peter Hook and Herbie Saccani throughout the evening. Hacienda Classical for 2019 will feature its fourth new set as the now well travelled show has been updated year on year, reinterpreting seminal dance classics with the orchestra. Since February 2016 it hast has performed some 40 concerts playing to audiences totalling over 300,000 in total with international concerts taking place in Switzerland and Dubai. 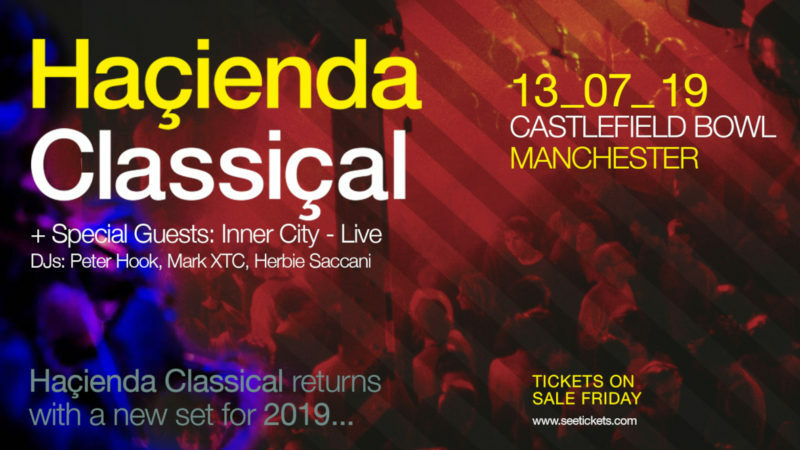 With the Castlefield concert providing the centrepiece to Hacienda Classical’s year, other dates for 2019 will follow in due course. Hacienda Classical at Castlefield Bowl comes on the final day of “Sounds Of The City”, the annual run of events at the venue which this year features Kyle Minogue, The Wombats, Elbow as well as Hacienda Classical. As Hacienda Classical enters its fourth year, these inspirational nights recreated the tunes that defined a generation for a whole new audience, renewing them and rearranging them with the orchestra, the DJ’s and many special guests who have graced the production.